Welcome to Part 2 of our Getting Started with the News API series. In Part 1 we introduced you to the API, the demo/query builder and the supporting interactive documentation. We also showed you how to perform a variety of basic searches to help you get familiar with the API. Today we’ll begin to explore some of the more advanced capabilities that the API has to offer from an analysis and insights point of view. Whether you’re pushing data from the News API into an app, resurfacing the analysis in a news feed or building intuitive dashboards with the extracted data, the News API enables you to obtain a deep understanding for what’s happening in the news, in near real-time. Before you go any further – have you created an AYLIEN account? If you’ve created your account already and learned how to perform basic searches in Part 1, let’s get cracking with Part 2, starting with the Time Series endpoint. We’ve created SDKs for some of the most popular programming languages which make using the API super easy. Just like Part 1, we’ve also included some code snippets for you to copy and build on. News API results are returned in JSON format, making it easy for you to do as you please with the data. Throughout this post, we will be displaying charts and graphs that we generated using the JSON results returned from the code snippet examples provided. A Time Series is a sequence of data points plotted over a specified time period. 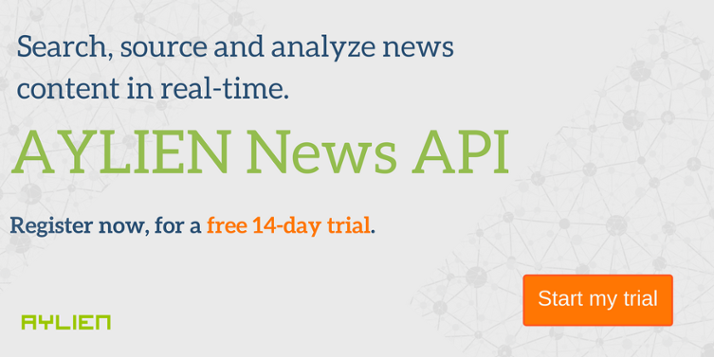 The News API /time_series endpoint can be used to analyze a set of data points relative to this specified period. This makes it easy to analyze timestamped data, allowing you to easily visualize the data in an understandable and meaningful format. Note: Make sure you replace the APP_ID and APP_KEY placeholders with your own API credentials. Again, if you haven’t got an API account you can sign up here. As we mentioned earlier, because the News API returns results in JSON format, you can display the results as you please. Here’s an example of a chart we built using the results obtained from the snippet above. By displaying our results on a pie chart, we can clearly see that negative sentiment far outweighs positive in our returned stories. By narrowing our search parameters we have the opportunity to compare and contrast sentiment polarity towards various entities from numerous sources, locations and so on. Your options and level of search flexibility here are pretty much endless. Visit our documentation for more info on the Sentiment Analysis features. A histogram is a graph that represents the distribution of numerical data. Our /histogram endpoint enables you to get an aggregated profile of a certain metric. Whatever that metric is, is up to you. For this example, let’s look at the Social Shares and Article Length metrics. The former will tell us the volume/spread of social media shares that articles mentioning our search terms have received, while the latter will show us the length of articles in word. Using the /trends endpoint enables you to identify the most frequently mentioned keywords, entities and topical or sentiment-related categories. Put simply, it allows you to measure the amount of times that specific elements of interest are mentioned in the content you source through the API. We’ve generated the word cloud below to visualize our results. As you can see, the two presidential candidates and their parties are, unsurprisingly, the most mentioned entities from the stories we sourced. Pennsylvania, Ohio, Florida: What is so important about these three most-mentioned states? Since 1960, no US president has been elected without claiming at least two of these states in the election. Aaah! Visit our documentation for more info on the /trends endpoint.